Strong adjustable hinge with 250mm long and 16mm diameter threaded rod. This fits to gate frames of 50mm or 2” frame. This is made out of steel and powder coated black. Price given is for one hinge only. Adjustment range in this hinge is 35mm. That means distance from the gate frame to the post is 65mm to 90mm. This hinge has facility to adjust the length even after installing it to a gate and post. Hinge is made out of steel and powder coated black. Price given is for one hinge only. Adjustment range in this hinge is 70mm. That means distance from the gate frame to the post is 60mm to 130mm. Stud is 16mm diameter and 200mm long. 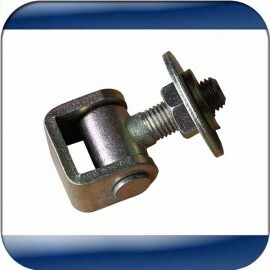 Hinge comes with two nuts and two washers and fits to 2” or 50mm square gate frame. Black powder coated Aluminium gate hinge to be used with light weight swing gates. Best suited for aluminium Pedestrian gates. Hinge gap is non adjustable and the gap is 20mm. This hinge can turn a little over 270 deg. Price given is for one hinge only. Black powder coated self closing Aluminium gate hinge to be used with light weight swing gates. Best suited for aluminium Pedestrian gates. Hinge gap is non adjustable and the gap is 20mm. Price given is for one hinge only. 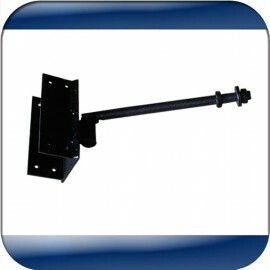 Strong Polymer black self closing gate hinge to be used with light weight swing gates. Best suited for Pedestrian gates, Swimming Pool gates etc. Hinge gap is non adjustable and the gap is 17mm. Price given is for one hinge only. This hinge is suitable for steel gates with medium weight. This is welding type adjustable hinge. Threaded rod is 16mm diameter. Distance between the gate and the post is 47 to 70mm adjustable. Hinge is made out of steel with zinc coated. Price given for one hinge only. This hinge is suitable for steel gates with heavy weight. This is welding type adjustable hinge. 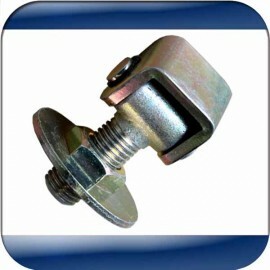 Threaded rod is 20mm diameter. Distance between the gate and the post is 51 to 70mm adjustable. Hinge is made out of steel with zinc coated. Price given for one hinge only. This hinge is suitable for steel gates with medium / heavy weight. This is welding type adjustable hinge. Threaded rod is 18mm diameter. Distance between the gate and the post is 51 to 70mm adjustable. Hinge is made out of steel with zinc coated. Price given is for one hinge only. This hinge is suitable for steel gates with medium weight. This is welding type adjustable hinge. Threaded rod is 20mm diameter. Threaded bar is 130mm long. 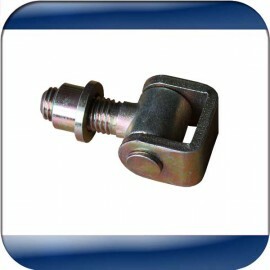 Hinge is made out of steel with zinc coated and comes with two nuts. Price given is for one hinge only.